One of the most common advice when it comes to health is to drink 8 glasses of water a day. It sounds trite but it is too true. Not just for weight loss but for many more benefits to your body. Find out some. 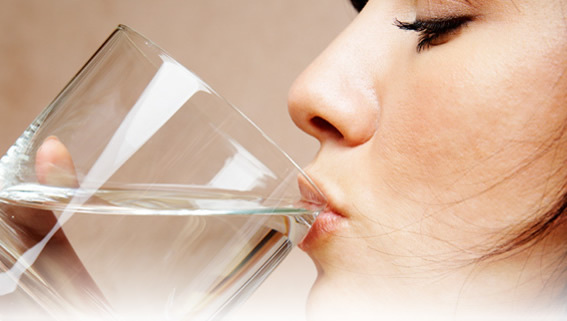 Weight loss: Water suppresses the appetite and increases metabolism. Drink a glass of water before eating helps you feel fuller and eat fewer calories. It benefits the kidneys: Water dilutes the salts and minerals that the body will form stones in the urine. It benefits the brain: If you are having a day diffuse, and the brain does not seem working correctly, take a glass of water. It is beneficial for the heart: The water reduces the risk of heart disease. According to a study by the Adventist Health Study, women who drink five or more glasses of water a day can reduce the chances of heart disease by 41% compared with women who drank only two glasses of water daily. Similarly, healthy men can reduce their risk of heart disease by 54 percent if you drink five or more glasses of water a day. Skin Benefits: A well hydrated skin looks more radiant and younger. Water helps to hydrate and increase elasticity. It also acts as a detoxifier and blood purifier resulting in a clean and clear face, and less acne. Beneficial for the stomach: the fiber and water go hand in hand with good digestion. Heartburn, gastritis and ulcers can also be prevented by drinking water. It helps with cramps: Proper hydration helps keep joints lubricated and muscles. Water is one of the main elements associated with muscle cramps. So, drink water before, during and after exercise can help prevent them. It gives you energy: The most common cause of daytime fatigue is mild dehydration. Water helps the blood to carry oxygen, and this level increases when the body is well hydrated. This leads to higher energy levels. Regulates body temperature: Water helps regulate your body temperature, especially during exercise, when you start to sweat. It is necessary that you stay hydrated during exercise for good performance. Keep a water bottle on your desk and drink regularly.